It is important that the Academy is informed of any absence on each day of the absence, prior to 9am if possible. The dedicated attendance line is 01297 630157 but parents may also use the main school number. When a student is absent from school, a note explaining the absence is required when the student returns. Registers are taken during first lesson and just after lunch, at 8.50am and 2pm. It is important that students are ready to start lessons at 8.50 and are punctual to each lesson. After registration closes pupils will be marked as late and pupils arriving after 9.20am or 2.15pm receive an unauthorised ‘U’ mark. It is a legal requirement to take registers in a timely fashion and there are consequences for lateness. We have an electronic calling system for absent students so that we can notify parents/carers as soon as possible if their child has not arrived at school in the morning. The calls begin shortly after registers are completed unless we have been notified of the reason for the absence. Calls continue until we receive notification of a reason for absence. Parents / Carers are to ensure that contact numbers and details are current at all times and inform school of any changes. Attendance is also marked electronically in each and every lesson so that we can identify any internal truancy issues and comply with safeguarding regulations. Students who arrive late or who leave the site for any reason during the school day must sign in or out. A letter from a parent must be provided if they are leaving during the day. Wherever possible, medical appointments should be made out of school times. Evidence of medical appointments must be provided at all times. It is vital that no student leaves the Academy site without permission from staff. Students are not permitted to telephone parents to ask to be collected in the event of illness but must always report to sick bay (see below). Lunch passes are issued at the Academy’s Year Leader discretion; students can collect them from their year’s pastoral co-ordinator. Students must bring a signed letter with a reason from a parent/carer to request a one-off or regular lunch pass. The student is then under the direct supervision of the parent/carer for the duration of the school lunch break. Students are not allowed in the town unless they are prefects and have signed out. The Academy carefully monitors student attendance. When necessary, parents will be notified of lateness and absence. 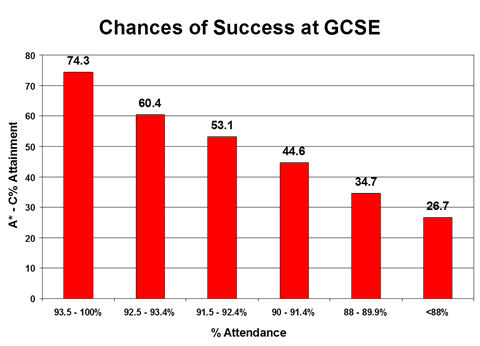 As this graph shows, there is a clear correlation between good attendance and academic success. Please support us in our efforts to ensure that all students make the most of their time in education. Parents/carers can apply in advance for leave of absence for exceptional circumstances via the S2 Absent Request Form http://axevalley.devon.sch.uk/wp-content/uploads/2019/01/Absence-request-form.pdf which is available from the Student Office or on the Academy website. Please read the form carefully. Requests must come from the parent/carer with whom the child normally resides and each application will be considered on its own merits. This is located in the Student Office in the Reception area of the main building. The Academy is limited in what it can do to look after students who are unwell or injured. All reasonable efforts will be made to care for students who come to sick bay either injured or feeling unwell. Parents will be contacted and asked to collect any student who is not well enough to attend lessons. Please help us to do this efficiently by ensuring we always have up-to-date contact information. We also have staff qualified in first aid to deal with any emergencies.